It is an honor to have the curator of The GSBF Clark Bonsai Collection, Mr. Bob Hilvers, come down to provide this month's demo. Please join us on April 17th where Bob will lead a Juniper Tree demonstration. He will be using this piece to talk about styling approaches and topics like the difference between the forms of alpine trees versus coastal tress and "bonsai" style versus "natural" representation of a tree image. The demo tree will be raffled off! Bob Hilvers first took up the art of bonsai almost thirty years ago as a hobby. 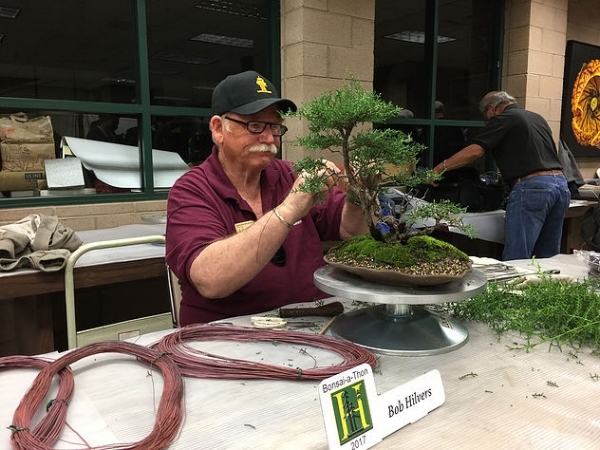 Bob is a past president of the Hanford Bonsai society, as well as the Golden State Bonsai Federation. He holds an adult teaching credential for the instruction of bonsai at the college level, and was one of the first “Bonsai Basics” instructors certified by the GSBF. He has written many articles for bonsai and art publications, presented lectures and demonstration programs for various bonsai organizations around the state, and has several Penjing (a Chinese form of bonsai) included in the permanent collection at the Huntington Library, Gardens and Art Museum. Now retired after a 36 year career in Public Safety, Bob keeps very busy as the Curator of the GSBF Clark Bonsai Collection at the Shinzen Friendship Garden in Fresno.